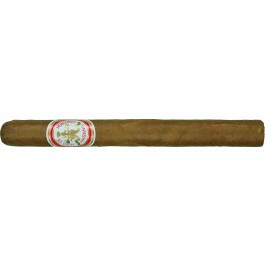 The Hoyo de Monterrey Churchills is a refined mild Habano of Julieta format, with a 47 ring gauge, 7" (178mm) long and comes in box of 25 cigars. It is difficult to find a better Churchill than that of the Hoyo de Monterrey brand. The tradition of this brand, one of the most prestigious of the cuban size range, requires care in its manufacture, which is only in the hands of the best cigar makers. Like all those of this brand, its flavor has that saline aftertaste that we always like to find in good cigars. If a definition was needed of a cigar's flavor, Hoyo de Monterrey is where that rare mixture is most appreciable - sweet and salty at the same time- a rare and exquisite combination, product of the very special soil of Vuelta Abajo. Even if it's born in the same castle, and made with the same spirit of its elder: this Churchill has its particular character. It has a core of herbal spiciness, and a light sweet woodiness on the palate. A very smooth tasting cigar.